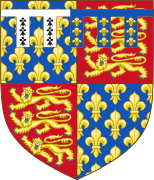 One of Henry IV's elder sisters, Philippa of Lancaster, married King John I of Portugal, and the other, Elizabeth of Lancaster, was the mother of John Holland, 2nd Duke of Exeter. 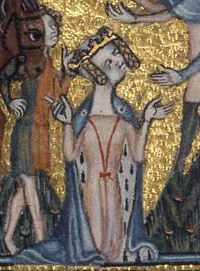 His younger half-sister Katherine of Lancaster, the daughter of his father's second wife, Constance of Castile, was queen consort of the King of Castile. He also had four natural half-siblings born of Katherine Swynford, originally his sisters' governess, then his father's longstanding mistress and later third wife. These four illegitimate children were given the surname Beaufort from their birthplace at the Château de Beaufort in Champagne, France. 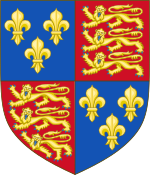 Henry's half-sister Joan Beaufort was the grandmother of Edward IV and Richard III. 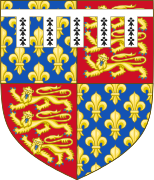 Joan's daughter Cecily married Richard, Duke of York and had several offspring, including Edward IV and Richard III, making Joan the grandmother of two Yorkist kings of the Kingdom of England. ^ Mortimer, I. (6 December 2006). "Henry IV's date of birth and the royal Maundy". Historical Research. 80 (210): 567–576. doi:10.1111/j.1468-2281.2006.00403.x. ISSN 0950-3471. ^ Janvrin, Isabelle; Rawlinson, Catherine (6 June 2016). The French in London: From William the Conqueror to Charles de Gaulle. Translated by Emily Read. Wilmington Square Books. p. 16. ISBN 978-1-908524-65-2. ^ Antiquary (10 May 1902). 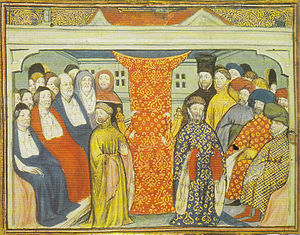 "Exhumation of Henry IV". Notes and Queries. 9th series. 9 (228): 369. doi:10.1093/nq/s9-IX.228.369c. ^ Given-Wilson, Chris (2004). Alfonso Antón, Isabel (ed.). Building Legitimacy: Political Discourses and Forms of Legitimacy in Medieval Societies. Boston, MA: Brill. pp. &nbsp, 90. ISBN 90-04-13305-4. ^ Richardson, D. (2011). Kimball G. Everingham (ed.). Magna Carta Ancestry. 2 (2nd ed.). Salt Lake City. p. 554. ISBN 978-1-4499-6638-6. 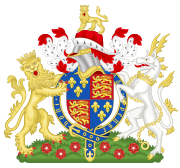 Complete Peerage (1926). G. E. Cokayne; Vicary Gibbs; H. A. Doubleday; Duncan Warrand; Lord Howard de Walden (eds.). The Complete Peerage. 6 (2nd ed.). London: St Catherine Press. Given-Wilson, Chris (26 April 2016). Henry IV. 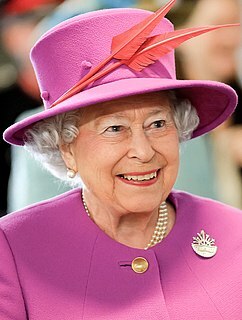 English Monarchs series. Yale University Press. ISBN 978-0-300-15419-1. 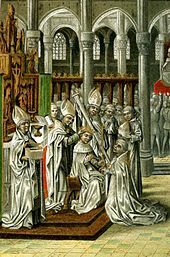 Wikimedia Commons has media related to Henry IV of England. Mary de Bohun was the first wife of King Henry IV of England and the mother of King Henry V. Mary was never queen, as she died before her husband came to the throne. Edmund Mortimer, 5th Earl of March, 7th Earl of Ulster was an English nobleman and a potential claimant to the throne of England. 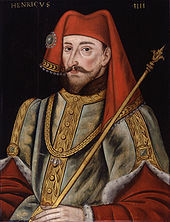 A great-great-grandson of King Edward III of England, he was heir presumptive to King Richard II of England, his granduncle, when Richard II was deposed in favour of Henry IV. 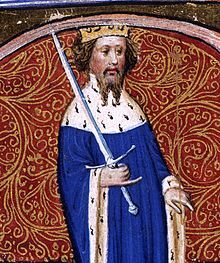 Edmund Mortimer's claim to the throne was the basis of rebellions and plots against Henry IV and his son Henry V, and was later taken up by the House of York in the Wars of the Roses, though Mortimer himself was an important and loyal vassal of Henry V and Henry VI. 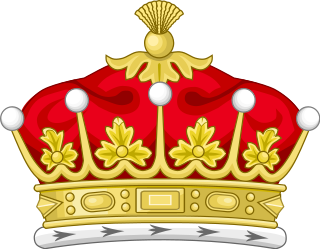 Edmund was the last Earl of March of the Mortimer family. 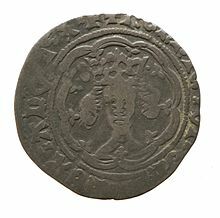 Henry Scrope, 3rd Baron Scrope of Masham KG, a favourite of King Henry V, was beheaded on 5 August 1415 for his involvement in the Southampton Plot. Thomas Chaucer was Speaker of the House of Commons and son of Geoffrey Chaucer, the poet, by his wife Philippa Roet. The Bohun swan was a heraldic badge used originally in England by the mediaeval noble family of de Bohun, Earls of Hereford, and Earls of Essex.